What is a Mamie Taylor? "...The Mamie Taylor was named after a Broadway singer and appeared around the turn of the last century, but within a few years it fell completely out of fashion. In 1900, it was the most popular cocktail of it’s day, and more than a century later, few people have ever heard of it—or Miss Taylor for that matter. Yet this drink has led to many variations that we do remember." The Mamie Taylor is a base for many popular drinks today and follows a simple formula that any bartender will recognize: Spirits + ginger ale or ginger beer + lime juice and garnish. Mamie Taylor is specifically made with blended scotch, and is said to be one of the most "deceptive" drinks out there, since it is so refreshing as a warm-weather drink. "The News", 5th July, 1900 "The latest hit on these hot days is a nice cool "Mamie Taylor." They are delicious." "Washington Post," 26th January, 1902 "With the dawn of a hilarious New Year there has been evolved for the delectation of New Yorkers a new form of liquid exhilaration. It has not yet reached Broadway, but seems to have been wafted from the chilly West and found an abiding place on Park Row. In whose brain the great idea originated is still a mystery, but when he discloses his identity his fame promises to eclipse that of the inventor of the Mamie Taylor..."
"The Post Standard", 7th March 1902 "It was while Miss Taylor was the prima donna of an opera company playing at Ontario Beach, near Rochester, in 1899," he said, "that she was asked with a number of other members of the company to go out sailing on the lake. As the day was hot and the breeze rather strong, the party returned after a few hours longing for some cooling refreshments. When Miss Taylor was asked what she would have she expressed the wish for a long but not strong drink--in fact, a claret lemonade. When the drink was served it was very evident that it wasn't a claret lemonade, for it looked like a delicious long drink of sparkling champagne. On tasting it Miss Taylor found itmuch to her liking, but asked to have the flavor softened with a piece of lemon peel. When this was done the new combination drink was declared a complete success. Bystanders had been watching the proceedings and noticing the evident enjoyment with which Miss Taylor and a few of her friends relished in new drink they finally asked the hotel keepr what drink it was that was being served to them and without hesitation the hotel man replied "a Mamie Taylor" and the name seemed to meet with instantaneous favour and has become famous all over the country." Drinks similar to the Mamie Taylor are the Moscow Mule and the ever popular Dark and Stormy. Part of becoming a better bartender is being knowledgeable about your drinks. Thinking of becoming a bartender? AACEA provides alcohol server training which promotes responsible service and sales of alcohol – sign up today and you’re eligible to win $100 fromAACEA and Len Riggs. 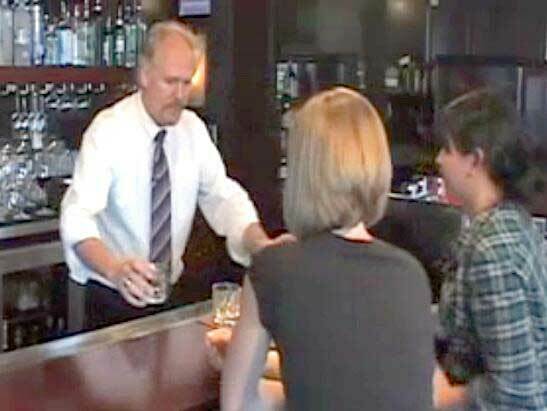 To get your alcohol servers permit in Washington visit www.aacea.com.